Updated Wednesday January 16, 2019 by Fountain Hills Little League. The Fountain Hills Little League, a 501(c)(3) non-profit organization, is committed to giving its players the best available baseball and softball experience. Since 1982, we are proud to have carried out this mission for the young boys and girls in Fountain Hills and its surrounding area. Our community-based program is made possible by generous donations from local businesses like yours. 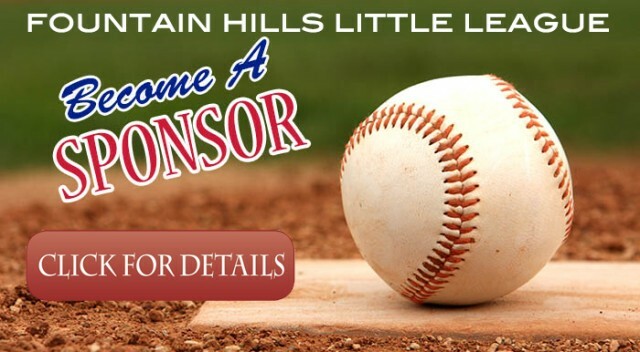 If you would like to advertise your business on the scoreboards you will not only get families of the Fountain Hills Little League viewing your logo, but anyone that comes to Golden Eagle for an entire year will see you business name! What do you get at each sponsorship level? Each sponsorship level has limited spaces available so we will work on a first come first serve basis. If you would like your business to be a team sponsor for a specific childs team we will do our best to match them up but we make no guarantees. Deadline for signup is February 10, 2019. Fountain Hills Little League is a 503c Non Profit, all donations are tax deductible.